Sterling C. Robertson, namesake of neighboring Robertson County, founded the town here in 1835, making it the center of Robertson’s Colony. After the Texas Revolution it was one of several sites considered to become new capital of the Republic. 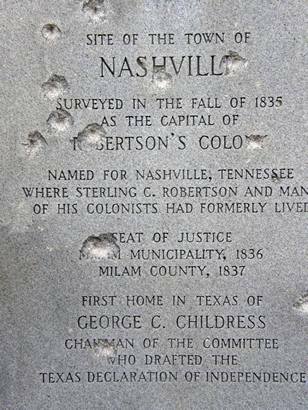 For nine years, beginning in 1837, Nashville served as the Milam County seat, but in 1846 Cameron took that title. Nashville may have continued on its own, but with the arrival of the Houston and Texas Central Railroad at Hearne in 1868, the thinning population all but abandoned the site, closing the town’s post office that same year. 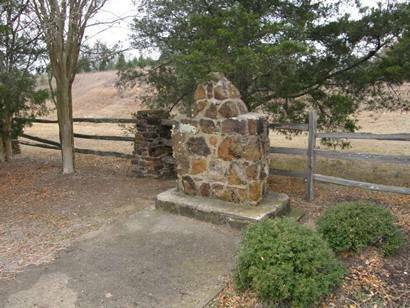 The Daughters of the American Revolution, with additional funds furnished from Milam County, bought part of the former site, deeding it to the state of Texas in 1927. 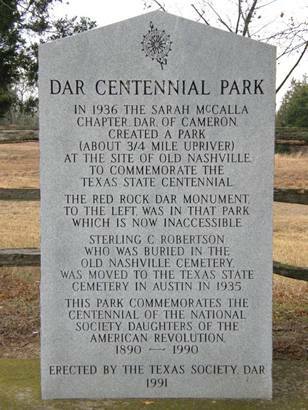 Nashville was remembered during the Texas Centennial with the markers shown above. 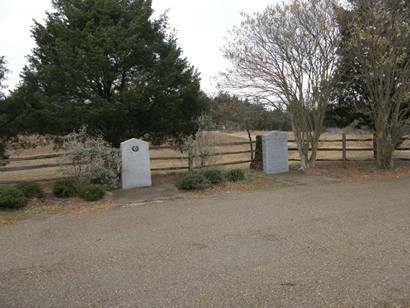 A cemetery at the site is shown on the TxDoT Milam County map.